The Progressive Catholic Voice: Elizabeth Johnson on Doing Theology, the Vatican's Investigation of the LCWR, and Criticism of Her "Little God Book"
Elizabeth Johnson on Doing Theology, the Vatican's Investigation of the LCWR, and Criticism of Her "Little God Book"
The following is excerpted from a talk Sister Elizabeth Johnson gave last Friday, August 15, 2014, at the annual meeting in Nashville of the Leadership Conference of Women Religious, the umbrella organization for most of the 50,000 Catholic nuns in the U.S. For the past two years the LCWR has been under investigation by the Vatican over a range of perceived problems with their doctrinal views and their social justice mission. I find doing theology an interesting, tough, and wondrous ministry in the church. One thousand years ago, Anselm defined theology as “faith seeking understanding.” Rooted in the Christian tradition and equipped with scholarly tools, those of us in the theological guild think about the meaning of faith and the way it is practiced. The purpose is to shed more light on the gospel, so it can be lived out with deeper understanding and vibrant love of God and neighbor. My scholarship has engaged a variety of subjects, such as language about God, the meaning of Jesus, the communion of saints, and evolution and creation, among others. Whatever the subject, for me teaching, writing, and public lecturing have always been an invitation to students, readers, and listeners to “Come and see,” as John’s gospel put it (Jn 1:39). Vatican II taught that “The truth cannot impose itself except by virtue of its own truth, as it makes its entrance into the mind at once quietly and with power” (DH 1). So come and see, think, raise questions, make connections, learn the tradition, see for yourselves how beautiful the faith is, as a step toward encountering and living out the love of the holy mystery of God. Every cultural era brings new questions which theologians try to address. Early on one key question arose for me when I realized that all the great thinkers whom I had been exposed to in my studies were men. I loved many of their insights. But where were the women? I was struck by the absence of their critical insights and spiritual wisdom. Inspired by a pioneering generation of American women theologians, I grew committed to bringing women’s voices to the table. This does not mean thinking about women all the time. It does mean using the human dignity of women as one lens through which think about other religious and ethical subjects. It means attending to poverty, lack of education, sexual violence, and other injustices that ruin women’s lives. It means employing theologically what promotes the flourishing of women in all their diversity. The year I received my doctorate and began university teaching, this direction grew stronger when four North American church women were murdered in El Salvador: Ita Ford, Maura Clarke, Dorothy Kazel, and Jean Donovan. Their courage and commitment had a profound impact on me. The spark of their lives has moved me to do theology in like spirit, attentive to the struggles and hopes of those most in need and under threat of violence. Clearly, my work engages theology done by men and does so with critical appreciation. But I am convinced that this is not enough for the church of today and tomorrow. The submerged female half of the church, indeed of the human race, is rising, and the faith we pass on to the next generations will be poorer if women’s insights are ignored. In taking this path, I and today’s cohort of women theologians are charting a new path. For centuries the study of theology was reserved for ordained priests as part of the hierarchy’s office to teach. One cannot overestimate the impact of Vatican II which opened the doors of theological study to lay persons. While excellent theology continues to be done by ordained priests, all kinds of new questions, methods, and understandings are now blossoming, fed by the experience of the laity, women and men alike. I take this leadership award to be in part a recognition of this seismic development. With gratitude I accept it as also paying tribute to women who do theology in this vein and to men whose work has an eye for inclusive justice. Normally I would stop here. But it would be disingenuous to ignore the criticism from the Congregation for the Doctrine of the Faith directed at the LCWR for giving me this award. Note that I would not be speaking about this if Cardinal Gerhard Mueller had not made his remarks public. The CDF sees this award as an insult to the U.S. Bishops whose Committee on Doctrine criticized my book Quest for the Living God. From Cardinal Mueller’s statement it appears that neither he nor the staff advising him read the book or my written response to the concerns raised, but rather channeled the U.S. committee’s judgment. Yes, Quest was criticized, but to this day no one – not myself, nor the theological community, nor the media, nor the general public – knows what doctrinal issue is at stake. Despite my efforts to give and get clarification, none was forthcoming; the face-to-face conversation I sought never came about. It seems the committee reduced the rich Catholic tradition to a set of neo-scholastic theses as narrow as baby ribbon, and then criticized the book for not being in accord with them. But as Richard Gaillardetz said in this year’s presidential address to the Catholic Theological Society of America, the committee’s assessment of Quest is itself theologically flawed. Indeed, the committee’s statement raises a multitude of issues in a confused way. It criticizes positions I take that are in accord with the Catechism of the Catholic Church. In several instances it reports the opposite of what the book actually says, in order to find fault. I am responsible for what I have written, but not for what I have not said and do not think. In my judgment such carelessness with the truth is unworthy of the teaching office of bishop. Cardinal Dolan of New York told me that the reason my book was singled out was because of its influence. And in truth, despite the committee’s criticism, thousands of messages poured in from people who had found Quest a help in their own journey of faith. Sales went through the roof (my community is grateful for the royalties!). Translations into European and Asian languages continue to be made; currently German is underway. I simply hoped that the book would serve this wider readership with insights into the living God, abounding in kindness in the midst of our suffering world. But now again my little God book and its author come under fire for supposedly serious yet still unclarified errors. What is going on here? To borrow Phyllis Trible’s words from her study of Eve and Adam, let a female speculate. It appears to me that a negative reaction to works of theology that think in new terms about burning issues has become almost automatic in some quarters. A judgment made somewhere that “this is harmful” gets picked up, amplified, taken for granted, and repeated. The adverse reaction becomes institutionalized. Reasons are murky, but a negative miasma colors the atmosphere whenever the subject comes up. This kind of institutionalized negativity sheds some light on how critique of my book and criticism of LCWR are intertwined. For the doctrinal investigation of LCWR gives evidence of a similar generalized negative pattern that has been a-building over recent decades. While reluctant to examine the context in scholarship and in life of statements made at LCWR Assemblies, the investigation’s statements express more of a vague overall dissatisfaction or mistrust on certain topics. Judgments are rendered in a way that cannot be satisfactorily addressed. In the absence of careful analysis, negativity spreads. Both of us are caught in an adverse situation not of our own making. Through careful discernment the LCWR has forged a response which is publicly modeling a different form of leadership. To a polarized church and a world racked by violence, your willingness to stay at the table seeking reconciliation through truthful, courageous conversation has given powerful witness. This is costly. The LCWR is experiencing the truth of Clerissac’s adage, “It is easy to suffer for the church; the difficult thing is to suffer at the hands of the church.” Nevertheless, under duress, you persist, giving honest, firm voice to your wisdom gained by years of mystical and prophetic living, as Pat Farrell said last year. What a grace for our time. What is going on here? Let this female speculate further by placing three frameworks around this situation, which will show that major forces are at work. 1) An historical framework: I could point to the centuries-long tension between religious orders and the hierarchy. This is not to say that some religious and some bishops do not work fabulously well together. But a strain perdures between a prophetic charism that seeks radical living of the gospel and an administrative charism focused on order. Stories of conflict between mother superiors and some bishops worldwide provide multiple examples; Australian Mother Mary MacKillop, first excommunicated and now canonized, is perhaps the clearest. Historians are already writing about the critique of the LCWR as yet another chapter of this historic tension. 2) A sociological framework: I could engage in a gendered analysis of power. The church did not start out this way, but as an institution it has evolved a patriarchal structure where authority is exercised in top-down fashion, and where obedience and loyalty to the system are the greatest virtues. Never before in the history of the church has there been such a cadre of educated women carrying forward the mission of the gospel as is now represented by the LCWR. In this framework the current CDF investigation appears to be an effort by certain ruling men to control committed, competent women whose corporate religious discernment makes them adult believers of conscience, silent and invisible no longer. 3) An ecclesiological framework: I could focus on the differing embrace of renewal in the post-Vatican II church. Implementing council’s mandate, women religious vigorously renewed their lives in accord with the gospel and the spirit of their founders. Consequently they moved toward the periphery, away from a cramped ecclesiastical center which Pope Francis calls “unhealthy from being confined and from clinging to its own security” (Evangelii Gaudium 49). Certainly the LCWR and the Sisters they lead are far from perfect. But they’ve got the “smell of the sheep” on them, embodying a church “that knows how to open her arms and welcome everyone.” Like a “field hospital for the wounded,” they have stood in solidarity with the poor, immigrants, battered women, LGBTQ persons, and even the wounded earth itself. To my knowledge, a similarly vigorous process of post-conciliar renewal has not taken place at the Congregation for the Doctrine of the Faith, a particular curial office at the center. It has become common knowledge that Pope Francis was elected with a mandate to reform the Curia. This mandate, of course, includes the CDF. Until such reform happens, criticism is almost inevitable because the different pace of renewal has resulted in different ways of being church. Finally, let me dream of one more framework that might yet take shape, namely, reconciled diversity so we can collaborate mutually for the good of the world that God so loves. As Pope Francis wrote, conflict does arise but it can become "a link in the chain of a new process." This can only happen if people have peacemaking hearts, and are willing to go below the surface to see others in their deepest dignity (EG 227-228). Gustavo Gutierrez has expressed his admiration for Gerhard Mueller, citing how this student of his worked many summers among the poorest of the poor in Peru. Can the LCWR’s evident commitment to the poor become a common ground for mutual understanding? To this day it extends a hand in friendship, seeking communion with the CDF in solidarity with the marginalized of this world. Perhaps Cardinal Mueller can extend a hand of friendship back to American women religious, who at first may seem as strange to him as were the Peruvian poor but who are also God’s beloved people. It would be a blessing for the church if he could find a creative way to bring this investigation to an end in a productive manner. When the needs of the suffering world are so vast; when the moral authority of the hierarchy is hemorrhaging due to financial scandals and to many bishops’ horrific dereliction of duty in covering up sexual abuse of children, a cover-up which continues in some quarters to this day; when thousands are drifting away from the church; when the liberating gospel of God’s abounding kindness needs to be heard and enacted everywhere: the waste of time and energy on this investigation is unconscionable. Wouldn’t it be great if we could be partners, not adversaries, for the good of the church and the world. To read Elizabeth Johnson's LCWR talk in its entirety, click here. 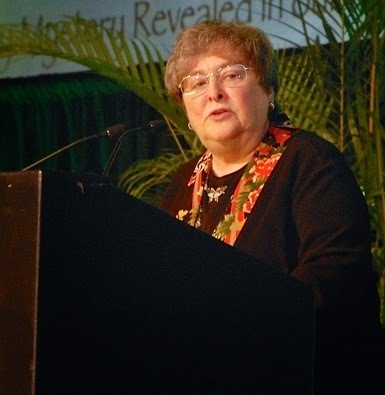 At LCWR Assembly, Elizabeth Johnson Speaks Her Mind – Mollie Wilson (Commonweal, August 18, 2014). Johnson to LCWR: Sisters Ahead of Hierarchy in Living Vatican II Renewal – Dan Stockman (National Catholic Reporter, August 15, 2014). Under the Vatican’s Dark Cloud, Nuns Continue to Support LGBT People – Francis DeBernardo (Bondings 2.0, August 19, 2014). Thanks for posting this, Michael. I wish it were possible to produce thunderous applause in words for Sister Elizabeth Johnson. I'd do it here.